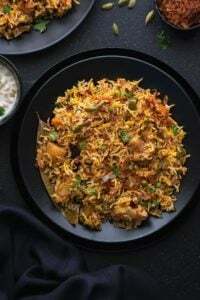 Best Vegetable Biryani Recipe – It’s light, easy to cook and so yummy. Fragrant basmati rice cooked with choice of mixed vegetables, basic Indian spices and herbs is just irresistible. The biryani recipe that gives you fluffy, aromatic and flavourful meal that is ready under 30 minutes. 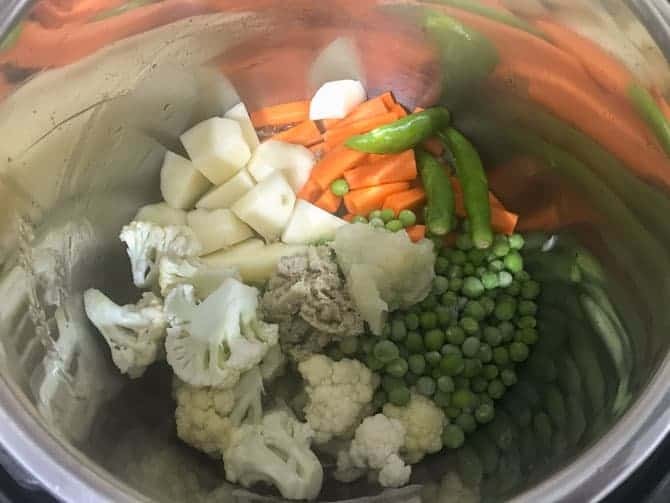 Here is how to make veg biryani recipe step by step in the instant pot pressure cooker. Traditional authentic veg biryani recipe involves layering and dum (slow cooking). It is quite a time consuming and longer process as compared to this. Whereas, this recipe is an easy one pot biryani recipe that needs no marination or special ingredients. 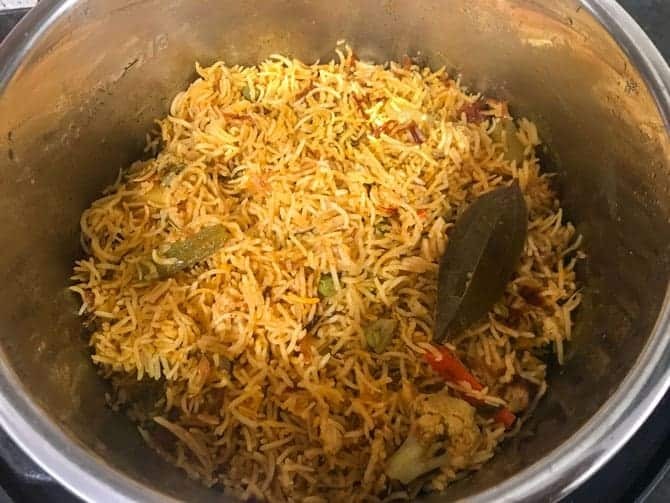 Great news is, you can also cook this vegetable biryani recipe easily in a regular pressure cooker on stove top. 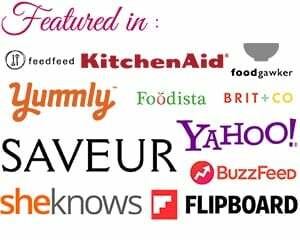 Wouldn’t it be a great addition to your weeknight dinners or weekend meals? I am sure it would be. Because, this veg biryani has all the reasons to be in your fav list. 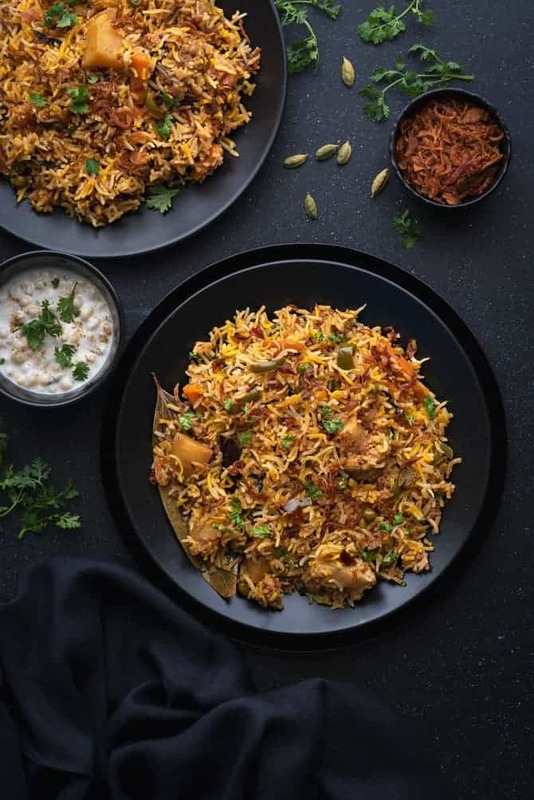 Why An Instant Pot to Make Vegetable Biryani Recipe? Let me confess, I bought the IP in September 2018 and it was simply lying in the shelf packed for 4 months. I don’t know why, but I had a fear that will I be able to use it properly or not, or how long would it take me to get use to it? With 100’s of stupid thoughts in my mind, I was reluctant to get my hands on it. Well, keeping all thoughts aside, I decided to give it a try, “it might take few trials and errors, but am sure I will adapt to it easily”. 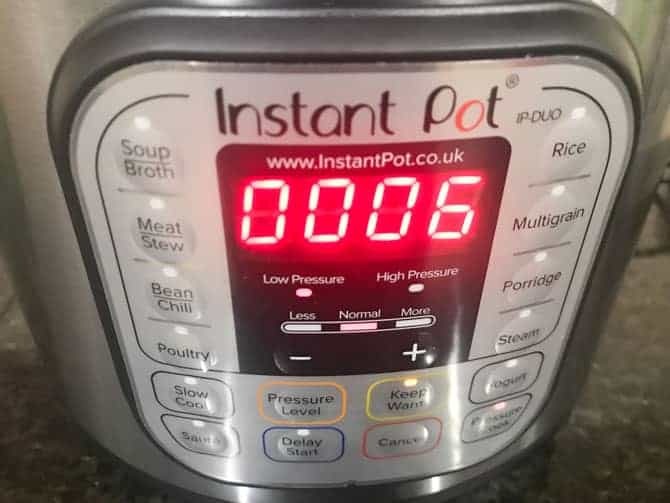 Trust me, that day and today, Instant Pot hadn’t failed me. The best part of the IP is I never have to baby sit while cooking anything. Heat, Sauté, Close the pot, Set the timer and leave. Never ever in my life I have cooked curries or biryanis or pulaos in just few minutes. Plus, the taste of the food is simply amazing. 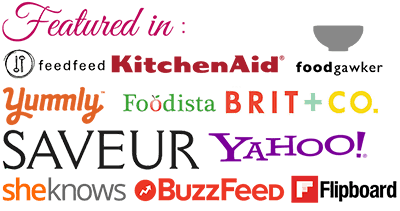 In coming days, I shall share my best international and Indian Instant pot recipes here, InShaaAllah! 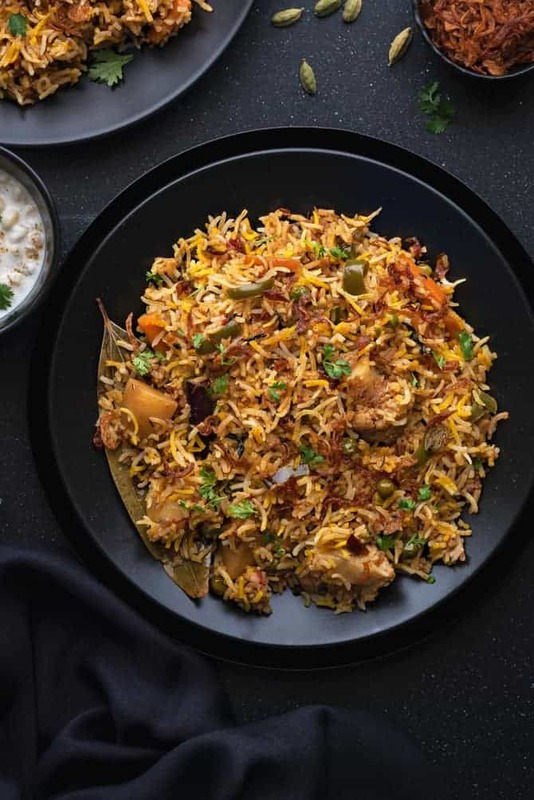 This One pot Vegetable biryani recipe is one of them. It took me flat 20 minutes to make this recipe in an instant pot. Rice – Good quality long grain Rice , either Basmati or Sela Rice. 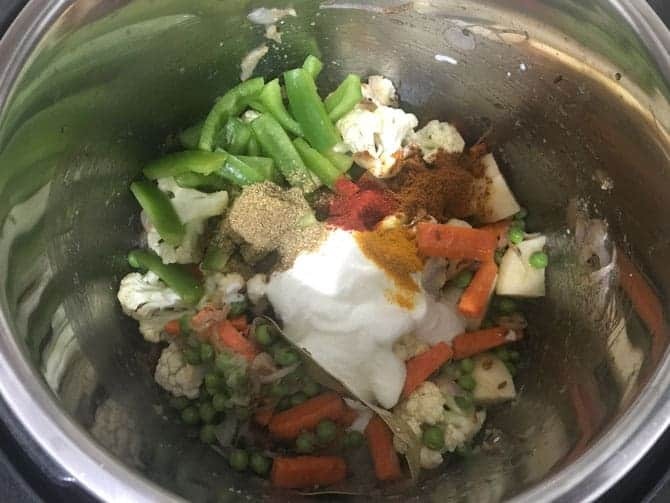 Vegetables – I have used a mix of potatoes, peas, carrots, capsicum and cauliflower here. You are free to use the vegetable of your choice. Addition of mushroom, tofu, paneer is always welcome. Whole Spices – Bay leaves, cumin seeds, cinnamon sticks, green cardamom, star anise, cloves and black peppercorns. Spice powders – Garam Masala powder, turmeric powder, coriander powder and red chilli powder. You can go on ahead with cayenne pepper or smoked paprika as well. 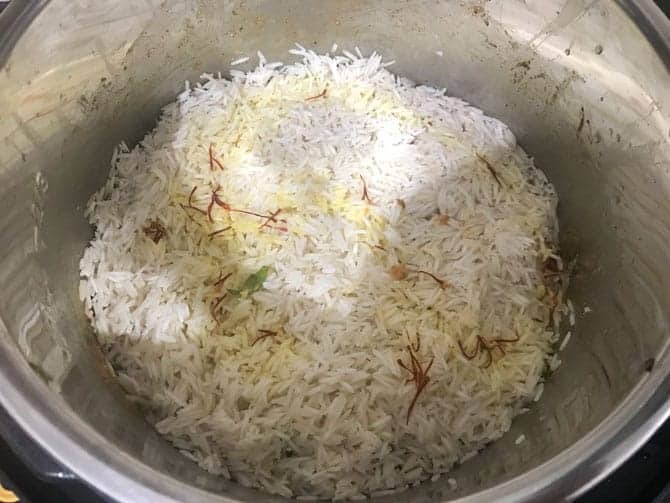 Soak the rice for 15 minutes for best fluffy veg biryani. A mix of both ghee and oil gives aromatic and super flavourful biryani. But, you can use either ghee or oil, but skip ghee if you plan to make vegan veg biryani. Use long grain rice to make biryani appealing as well as delicious. Do not compromise on quality of rice to make biryani. 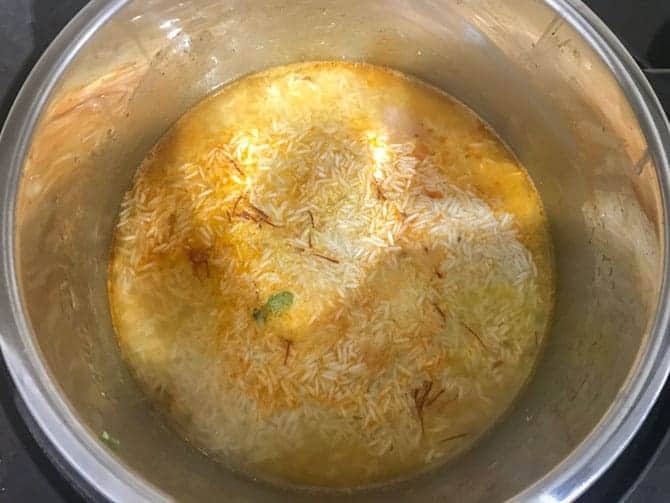 How to make veg biryani in pressure cooker on stove top? 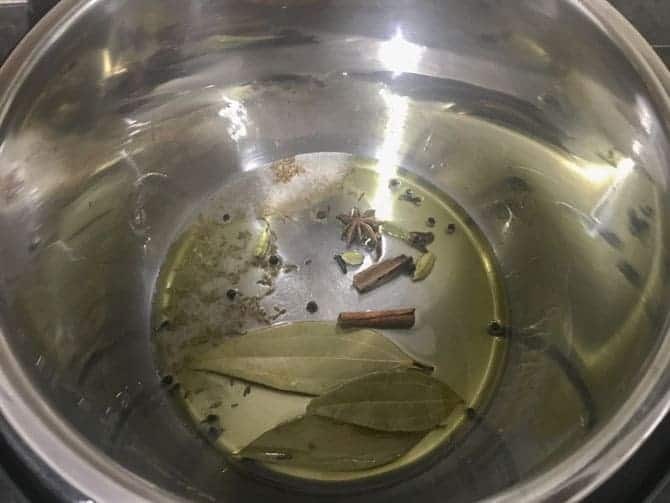 To make veg biryani in pressure cooker, heat mix of oil and ghee or either of them. Add whole spices and fry for few seconds. Add sliced onions and fry until it starts picking up golden tint. Add whisked yogurt, red chilli powder, turmeric, coriander powder, garam masala powder, salt and mix. Cook for a minute. Then, top the vegetables with chopped mint leaves, coriander leaves, fried onions. Without mixing, layer the soaked and strained rice and saffron milk. Add 3.75 cups of water and lemon juice, check for salt and add some more. Pressure cook for 2 whistles on medium flame and then switch off the heat. Allow the pressure to release naturally. Then, add whisked yogurt, spice powders, little salt and mix. Add 1 cup of water from the sides of the inner pot. Top the vegetable layer with chopped mint and coriander leaves, fried or caramelised onions. 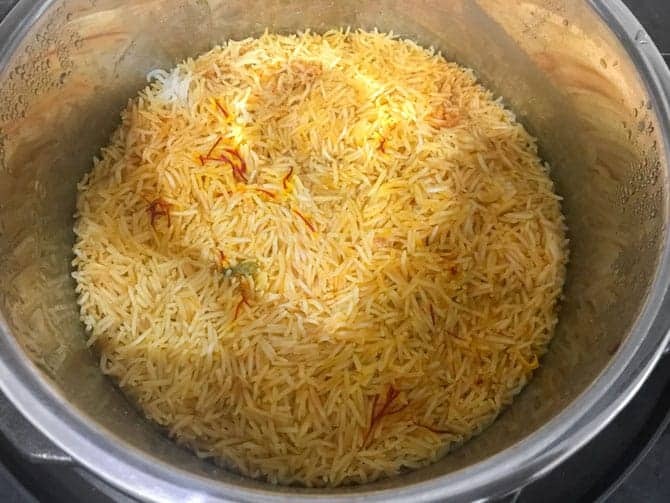 Layer the soaked and strained rice evenly, sprinkle saffron water, salt and lemon juice on the top. Pour 2 more cups of water from the side of the pot such that rice is just immersed under water. Do not stir at this point. Immediately cover the IP lid with the vent in sealing position and cancel the ‘Sauté’ mode. Switch on the ‘Manual/Pressure Cooker Mode’. Pressure cook the veg biryani on low pressure for 6 minutes. Once the IP beeps, manually release the pressure carefully and open the pot, allow it to rest for 5 minutes. Top the biryani with some more caramelised or fried onions and fluff up the rice using fork. Serve Veg biryani with raita of your choice. 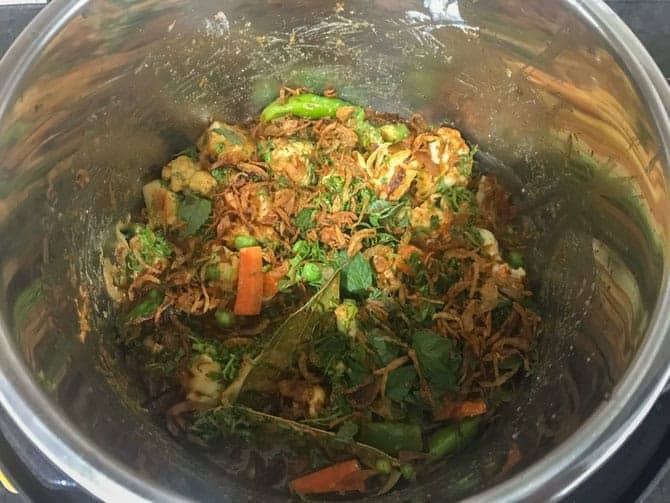 Have you tried this “Veg Biryani Recipe“? Please feed us with your ★ star ratings and comments below. Then, add whisked yogurt, spice powders, little salt and mix. Add 1 cup from the sides of the inner pot. Top vegetable layer with chopped mint and coriander leaves, fried or caramelised onions. Pressure cook the veg biryani of low pressure for 6 minutes. Once the IP beeps, manually release the pressure carefully and open the pot, allow it to rest for few minutes. Top the biryani with some more caramelised or fried onions and fluff up the rice using fork. Serve Veg biryani with raita of your choice. Add 3.5 cups of water and lemon juice, check for salt and add some more. Pressure for 2 whistle on medium flame and then switch off the heat. Allow the pressure to release naturally. You can add any vegetables of your choice along with paneer, tofu and even mushrooms. Adjust the spiciness as per your liking. To make vegan vegetable biryani, skip using yogurt and ghee. 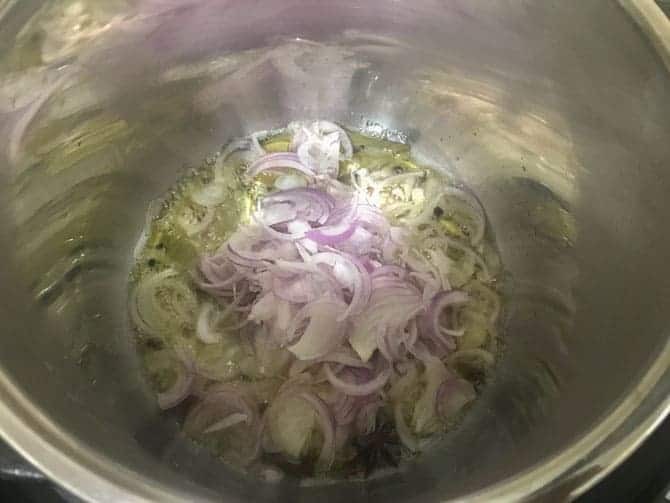 To make no onion no garlic veg biryani, skip onions and garlic and proceed with the rest.